Theresa May’s ministers are threatening to walk out of her government over her reported plans to keep Britain potentially tied to a customs union with the EU permanently after Brexit. Andrea Leadsom and Liam Fox and other senior Cabinet ministers are reportedly threatening to quit. The rows come with just days until her crucial summit with EU leaders dubbed a “moment of truth” by the EU’s chief negotiator Michel Barnier. 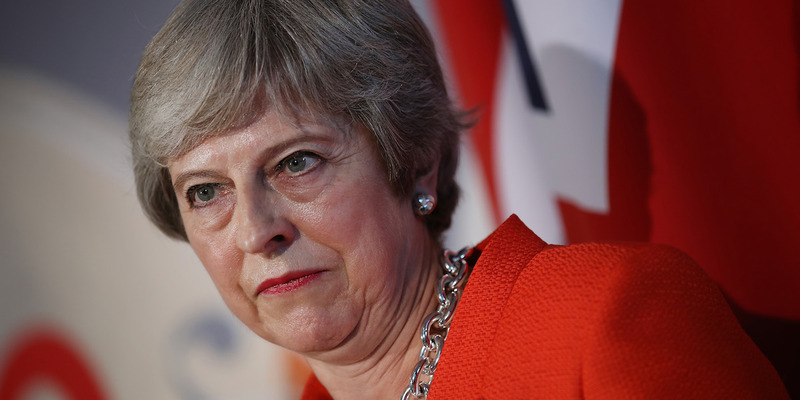 LONDON – Theresa May is under pressure to reverse course after Cabinet ministers threatened to walk out over her reported plans for a potential Brexit “backstop” which could effectively keep Britain permanently inside a Customs Union with the EU after Brexit. The Prime Minister reportedly asked senior ministers in her “Brexit war cabinet” on Thursday to agree to a proposal to keep Britain inside a customs union with the EU, if she fails to agree on any alternative arrangements before the end of the two-year Brexit transition period. May’s equivocation is leading senior ministers to consider their position. Trade secretary Liam Fox reportedly told friends that her proposal “would make life very difficult for me,” according to a Mail report, because it would limit the UK’s ability to strike new free trade deals outside the EU. Commons leader Andrea Leadsom is also reportedly threatening to walk out of government if May refuses to abandon her plans. At least three Brexit-supporting Cabinet ministers are also understood to be considering resigning in protest if May capitulates to EU demands on the time-limit, the Telegraph reported. Penny Mordaunt, the international development secretary, and Esther McVey, the work and pensions secretary have the most significant concerns over the plans, although they did not attend last night’s meeting. But many senior ministers fear that the arrangement could become permanent, and reportedly raised their concerns with Theresa May at last night’s meeting. The time-limited backstop is now the last obstacle to the UK and EU agreeing the terms of a Brexit divorce deal, but it is a big obstacle. Many Cabinet ministers last night warned May that the plan simply would not pass through the Commons if it did not contain a time-limited provision because it would look like the UK had agreed to an endless customs union with Europe, the BBC reported. But the EU is unlikely to back down, pointing out that the backstop provision needs to be “all-weather” to fulfil its function as an emergency measure to avoid a new border in Ireland. The Democratic Unionist Party (DUP) is the other big issue for the prime minister, who relies on the Northern Irish party’s votes to give her a notional majority in parliament. The party objects the backstop plan because it would effectively keep Northern Ireland in the single market for goods and therefore place a trade barrier on businesses moving goods from one part of the UK to another. Arlene Foster, the DUP leader, said on Thursday afternoon that the prime minister could not “in good conscience” recommend such a deal and vowed to oppose it. “These are significant days for Northern Ireland and the United Kingdom as we know it,” she said. Theresa May’s week has been hellish, but next week could be even worse. She must negotiate a deal that is acceptable to the EU, her own Cabinet, to backbench Tory MPs, and the DUP, groups which have diametrically opposed interests. Whether it is possible is likely to become clear next week, when the prime minister heads to Brussels for what could be a potentially historic summit with other EU leaders.